I scream you scream we all scream for ice cream .Okay so I've had my far share of ice cream but I have to say this is one of the best I've tasted. I'm talking about the one above that I devoured at Fortnum and Mason's The Parlour. 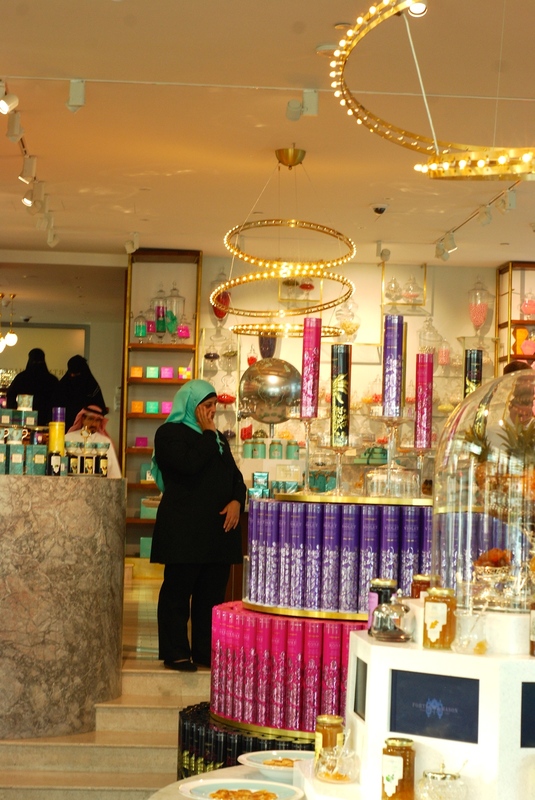 The Parlour is on the top level of Fortnum and Mason a high class department store from the UK specialising in gourmet groceries, teas and produce, it's made it's way to the middle east located outside the Dubai Mall facing the Fountain. Back to the ice cream experience level 3 is a pastel lovers dream with cushioned retro stools and an ice cream bar in the centre - it feels like a modern step back in time when sundaes and ice cream parlours were all the rage. Guests can opt to eat indoors or outside and view the fountain show from the balcony an added bonus and a hit with kids I would imagine. The ice cream bar has an array of flavours both traditional and some a little offbeat. On both sides of the ice cream are the mix in fresh fruit on one and candy on the other. The menu is extensive but gives you the option to choose from pre-concocted indulgences or make your own. We opted for one of both my husband chose the banana split this was mammoth we could have easily shared it between four people but it was every bit as delicious as it looked. I choose to make my own with a scoop of white chocolate and salted caramel complete with fresh strawberries white chocolate drops and popping candy - I'm glad to have taken that choice it made it so much more interesting texture wise and there was definitely a party in my mouth. This was more manageable for one person and quite easily one of my favourite ice cream experiences this is a must visit place we will be back with visitors who have a sweet tooth. Fortnum and Mason also specialise in high tea of which we are yet to experience but looks pretty incredible, if these two tea cakes below are anything to go by I am sure it will be a hit. Make sure you stroll through their gourmet goods section on the way out and sample some produce it's good stuff .. but me I have my eye on one of their F&M picnic baskets I think they just made picnics look cool all over again.